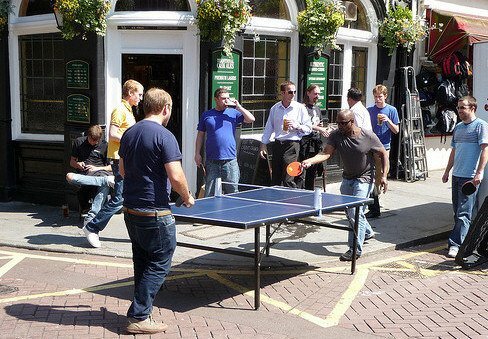 Outdoor table tennis is becoming more and more popular. But what do you need to know before you start? Can you play table tennis outdoors? Table tennis is usually a game that's played indoors, but it's also very easy to set up outdoors too. Playing outdoors has been popular in China for many years, but it's now catching on in other countries as well. Indeed, in London, England, a charity group set up 100 outdoor table tennis tables in the summer of 2010 to promote the 2012 Olympic Games. Called Ping London, it was a great success, and although it was only supposed to be for a one month period, the majority of the outdoor tables proved so popular that they were left in place permanently. 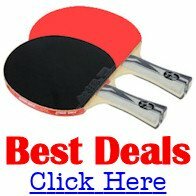 Discover more about concrete table tennis tables and buy the best available. The best models of outdoor tables have galvanised steel undercarriage, net and posts, and a weatherproof top surface. If you use a table tennis table outdoors which is only designed for indoor use, you'll probably find that the table top will warp very quickly. Direct sunlight, damp conditions and rain will easily cause warping, so you need to use a table which is designed to resist water and temperature extremes. The most durable, weatherproof outdoor tables available are concrete table tennis tables. Rule 2.01.03 states that the playing surface can be of any material, but it has to have a uniform bounce of about 23cm (9 inches) when a standard table tennis ball is dropped on to it from a height of 30cm (12 inches). However, for recreational use, the playing surface can be of any continuous material. And because the finish of the playing surface determines the frictional properties more than the material does, a broad range of materials can be used - so long as the bounce is suitable. Therefore tables are available with tops made of plywood, particle-board, plastic, metal, concrete and fibre-glass. But for major tournaments, only wood or wooden derivates can be used. Is is designated as an outdoor table? 5 feet (1.525m) wide and 2 feet 6 inches (76cm) high? Does it includes a weatherproof net and posts? How many pieces make up the table? Is it easy to dismantle and store? 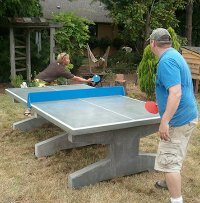 There's more information about playing table tennis outdoors and concrete table tennis tables here.